The Summer is here and yet another month has past which seem to have gone so quick thanks to the hot weather! Just before we where heading to Germany to visit our Family we received another Degustabox full with delicious new treats to discover! #1 Deliciously light in texture the Swiss Style muesli from Jordans is a blend of crispy wheat flakes, creamy oats, juicy raisins and finely sliced almonds. A simple classic and naturally with no added sugar: splendid. I have cereal and fruit every morning and i am a huge Jordans fan for while now so i loved the taste of the Swiss Style Muesli! #2 Bahlsen’s delicious milk chocolate Choco Leibniz are now available in handy portion packs of two biscuits to go. Our original crisp butter biscuit set into smooth continental milk chocolate. Perfect for picnics, packed lunches or even to pop into your handbag for a tasty snack under 150 calories. It’s not just a biscuit, it’s a Bahlsen. Growing up in Germany Bahlsen was and still is huge over there and a Family favourite for sure only bad thing was that i had to share some with my husband who loved them equally as much as me! 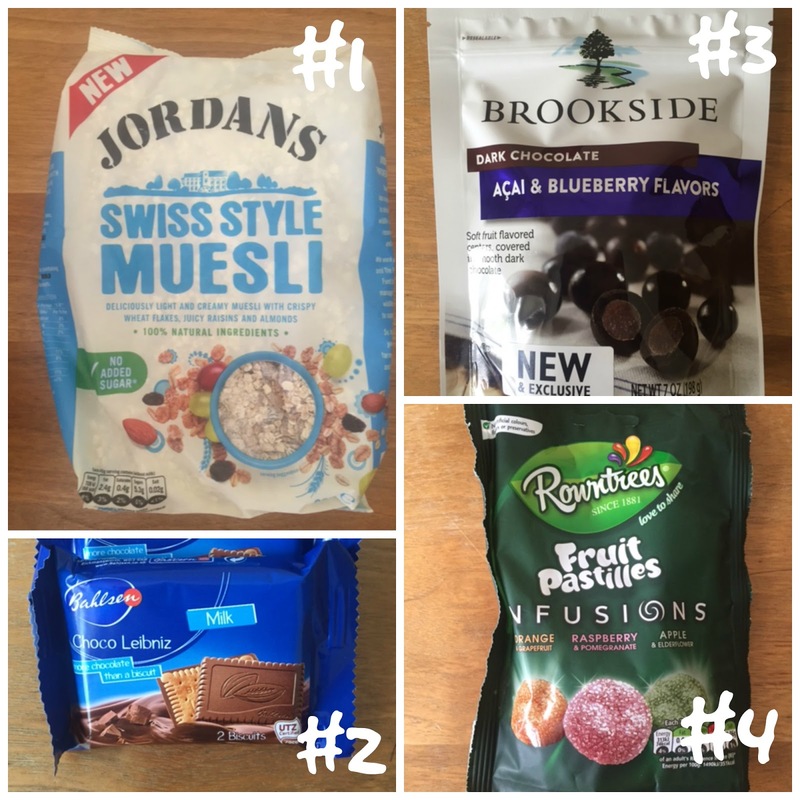 #3 Brookside – Dark Choclate. Exotic fruit and berry flavors blend with smooth dark chocolate. Light and refreshing. Rich and rewarding. Wholesome and authentic. It’s an extraordinary taste experience you can have anytime. #4 Infusions are an exciting twist on Rowntree’s Fruit Pastilles, featuring 3 delicious fusions of flavours including orange & grapefruit, raspberry & pomegranate and apple & elderflower. Made with fruit juice, and with no artificial colours, flavours or preservatives. #5 Sarson’s, the expert in vinegar for over 200 years, now bring you a versatile full bodied balsamic from Modena, perfect as an accompaniment to salads or a recipe ingredient. The balsamic provides a distinctive gentle aroma with a tangy taste which goes perfectly on a salad or in a homemade pesto. I am looking forward to trying this balsamic vinegar when i make a tomatoe-mozarella plate again for our next Family BBQ. #6 Seabrook Lattice Food Heroes celebrate all that is good about British Food and Drink. Three little pigs make an award-winning chorizo with a rich Yorkshire twist. Now i let my husband try this one because it was a too adventures taste for my liking but my husband thought it was pretty nice and a good crunchy taste to it. #7 Edible seaweed is an Asian delicacy, heralded as the new vegetable crisp.The green superfood, seaweed is naturally packed with nutrients, zinc, iron & B vitamins. Seaweed’s superpower is its great source of iodine, a nutrient missing in most other foods, critically important in regulating hormones. and sweet soy & sea salt flavour. do like the seaweed flavour but it was too strong on it’s own. #8 The Felix sweet pickled crunchy gherkins are handpicked and are prepared using a traditional recipe with vinegar, sugar and spices. Their sweet taste and crunchiness makes them perfect to serve with your burger, in your sandwich or as a condiment. Our Felix Sweet Pickled gherkins are a brilliant all-rounder and a must-have in every household. The product is ready to serve, suitable for vegetarians and is Kosher Parve. Pickled Things are not really on my top list so i had to give this a miss but iam guessing it’s a delight for somebody who likes that kind of product. #9 Amino acid enriched spring water, Rejuvenation Water is specifically designed to deal with the rigours of modern life. Using Derbyshire spring water, natural fruit flavours and a unique amino acid profile, Rejuvenation Water fuels the immune system, builds a natural resilience to stress, depression and anxiety and aids protein digestion. I did mention it before in my previous degustabox reviews that personally i am not a huge fan of flavoured water so this one wasn’t to my taste. 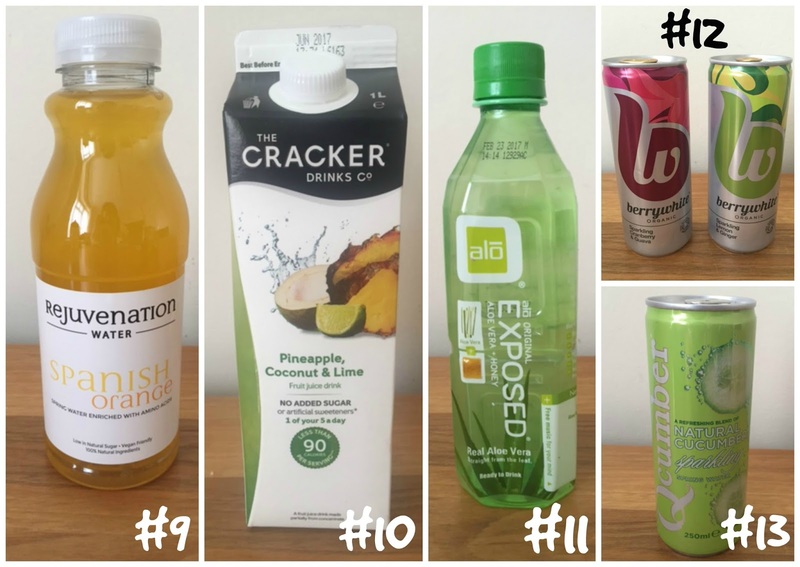 #10 Cracker Drinks Co. creates natural fruit juice drinks with no added sugar or artificial sweeteners. The drinks are also naturally lower in calories, averaging around 30% less calories per 100ml than 100% juice or added sugar juice Drinks. Pineapple Coconut and Lime is the perfect example. It represents 1 of your 5 a day but is only 57 cals per serving. I love this drink and the combination with the rich pineapple flavour, zesty lime and some smooth coconut to top it off makes it the perfect light summery drink! to every lifestyle and personality. I tasted the EXPOSED Aloe Vera drink and it’s pretty hard to describe Aloe Vera i am guessing people who like it will enjoy this drink. #12 At BerryWhite® All the drinks are certified organic and blended from natural non GM fruits. The exotic extracts, are also organic (naturally) with subtle flavour notes added to make drink combinations that appeal to every palate. With such lovely ingredients there is no need to add any sugar, fruit extract or artificial preservatives. In my box i received 2 flavours which was Lemon&Ginger (which was too gingery for me) and Cranberry&Guava (which i thought was a Little bit too bitter with the cranberry taste). #13 The quality of the water is fundamental to the taste of Qcumber. The source of the spring water lies in the old county of Radnorshire in Mid Wales. Qcumber contains only natural ingredients and is free from artificial sweeteners, colours, preservatives and flavourings. The ingredients are: carbonated spring water, natural cucumber extract, beet sugar, citric acid. I think this drink will certaintly be added to my next homemade Pimms for some summer celebrations! 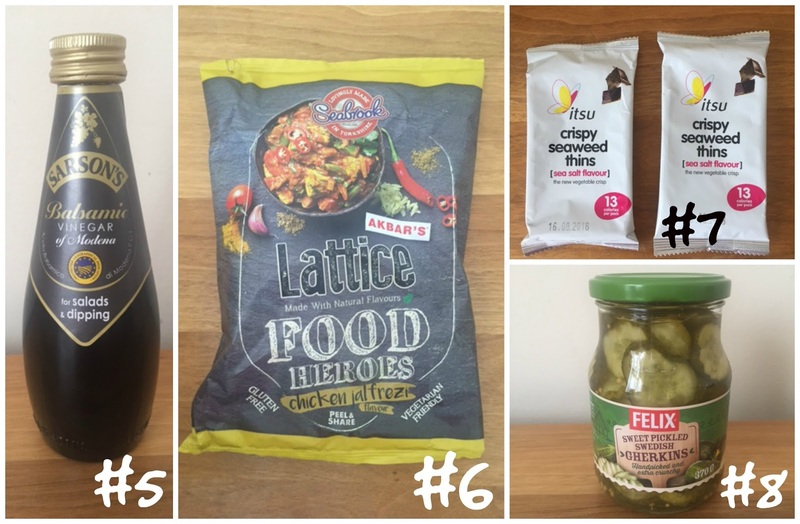 Overall we liked 9 items out of 13 the in the Box there where alot of ‘healthy’ drinks in this month box which i am personally not too keen on but it was still a good variety of food to weight it up. 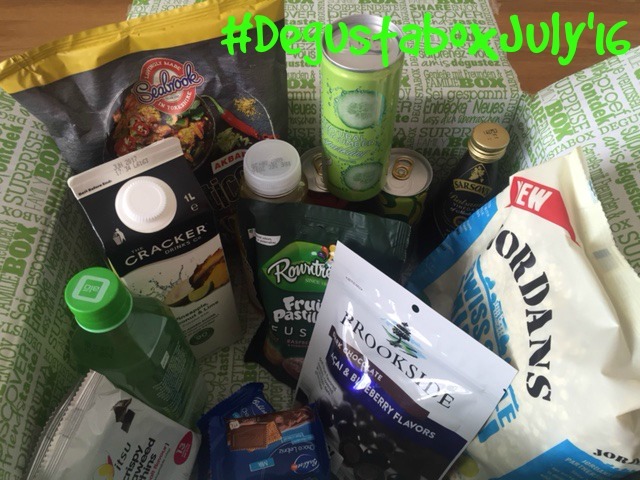 Disclaimer: I have been sent the July Degustabox for reviewing purposes, but all thoughts and opinions are mine.